What Do Reports Of A Vacate Order Mean For Standing Rock Protests? A new federal directive stands to have a serious effect on protests against the Dakota Access Pipeline. Following a series of increasingly violent confrontations between protesters and law enforcement near the Oceti Sakowin Camp, the U.S. Army Corps of Engineers ordered pipeline protesters to vacate Corps-managed federal land by early December or face charges of trespassing, Standing Rock Sioux tribe Chairman Dave Archambault said Saturday. Archambault told various media outlets the tribe had received a letter from the U.S. Army Corps of Engineers stating that land north of the Cannonball River would be closed to the general public on Dec. 5 in an effort to address public safety concerns. The letter did not specify if the protesters' encampment would be forcibly removed. "I am closing the portion of the Corps-managed federal property north of the Cannonball River to all public use and access effective December 5, 2016," a letter from Corps' District Commander John W. Henderson read. "This decision is necessary to protect the general public from the violent confrontations between protestors and law enforcement officials that have occurred in this area, and to prevent death, illness, or serious injury to inhabitants of encampments due to the harsh North Dakota winter conditions." Henderson warned that anyone found on Corps-managed land after the deadline would be considered to be trespassing and "may be subject to prosecution." He stressed the agency's decision to close the land to the general public also included Dakota Access pipeline protesters. "I do not take this action lightly, but have decided that it is required due to the concern for public safety and the fact that much of this land is leased to private persons for grazing and/or haying purposes as part of the Corps' land management practices." He directed protesters to a "free-speech zone" that had been established south of the Cannonball River. In a statement released Saturday, Archambault said that while the tribe was "deeply disappointed" by the U.S. Army Corps of Engineers' decision, their "resolve to protect our water is stronger than ever." 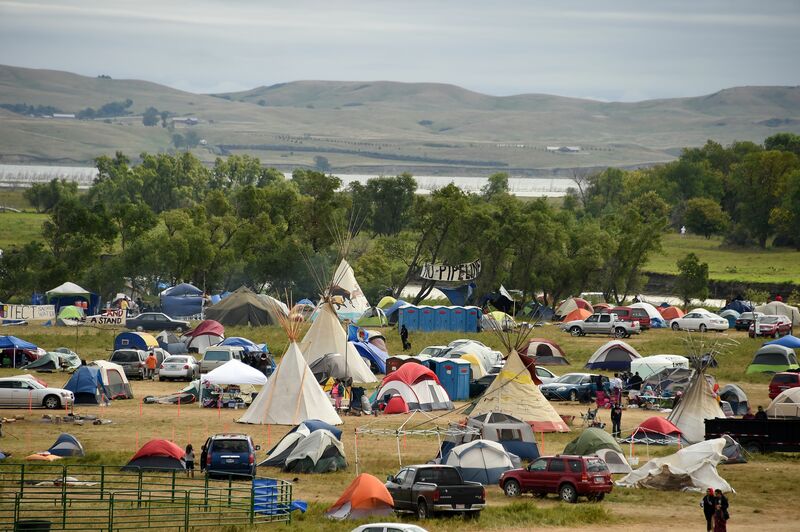 He called on President Barack Obama to deny Energy Transfer Partners the necessary permits to run the oil pipeline under the Missouri River north of the tribe's reservation. Part of the land being closed to public use serves as the location of the Oceti Sakowin camp, where pipeline protesters have been gathering and organizing for months. In the last few weeks, however, violent clashes between protesters and police have resulted in hundreds of arrests and several injuries. "It is both unfortunate and ironic that this announcement comes the day after this country celebrates Thanksgiving – a historic exchange of goodwill between Native Americans and the first immigrants from Europe," Archambault said Saturday. "Although the news is saddening, it is not at all surprising given the last 500 years of the treatment of our people."